On 27 October 2016, the first Belarusian Nobel Prize winner Sviatlana Alexievič made a donation to the Ravenka family, a couple in Slonim with six children. She deliberately made her act public, as discussions of this particular case in the media are telling of the many challenges faced by large families in Belarus. Despite some state support, large families in Belarus struggle to survive financially. Many also suffer from stereotypes and prejudices: some view families with more than two children as a burden on the social system or, even worse, as intentional parasites. Moreover, economic insecurity, combined with the poor housing situation, are significant obstacles for Belarusians considering having more children. These hurdles threaten to make large families extinct. Even though the birth rate has grown in recent years, experts anticipate a decrease in the Belarusian population in the future. By October 2016, the population of Belarus comprised 9,505,200 people. On 17 November 2016, the UNFPA Belarus, in cooperation with the Ministry of Labour and Social Protection, presented a study on possible demographic scenarios for the country. Most of them predicted that the economy would continue to stagnate, keeping the birth rate low. According to the worst case scenario, the population of Belarus could fall by half a million people by 2030. Among the major factors contributing to the negative trends, experts identified depopulation, rapid ageing, low birth rates (which do not guarantee population replacement rates), and uneven distribution of the population throughout the country. For instance, over the past 17 years, the Belarusian regions have lost about 10 per cent of their population. Currently, roughly 20 per cent of the population resides in Minsk; this is slightly more than 1,900,000 people, not taking into account those who stay in the capital temporarily. On top of these negative demographic trends, the 21st century is transforming social perceptions of the family structure. People no longer prioritise having children. The recent increase in birth rates is likely a short term phenomenon, as the state will not be capable of supporting such trends financially. Experts agree that in the long term, negative demographic trends could increase pressure on the social system and contribute to GDP decline. Thus, Belarus still needs to develop an effective approach towards sustaining its birth rate. Belarus has been actively promoting the image of a large family since the early 2000s. A family qualifies for the status of 'large family' if it has three or more children. Currently, there are over 62,000 such families. The state offers them a number of benefits and financial incentives. In 2015, it introduced a family capital programme, offering a one-time allowance of $10,000 to families who decide to have or adopt a third child. Other benefits for large families include tax incentives and special low interest mortgage loans. The state also compensates mortgage loan payments, depending on the number of children in the family. For instance, if a family has four and more under-age children, the state covers 100 per cent of their loan payments. Currently, more than 4,800 large families live in Minsk. If they decide to build their own house, they qualify for priority in distribution of land plots within city limits. However, in response to recent hotline questions, Head of the Minsk Executive Committee Andrej Šorac stated that individual construction would not be possible for large families in Minsk anymore. He justified this by pointing to the lack of available plots. Ironically, only a month ago, the Minsk municipality did not have this land allocation problem when deputy prime minister Natallia Kačanava decided to build a house in the elite suburb of Drazdy. Lukashenka, the president of Belarus, has stated on many occasions that Belarus needs at least 25–30 million people to secure full economic independence. However, large families are not likely to become common in Belarus. Fighting social rejection and bureaucratic hypocrisy is only part of the problem. Political analyst Valer Karbalevič pointed out that birth rates are falling all over Europe, and Belarus is victim to the same trends. Moreover, he pointed out that Belarus in particular faces a number of challenges in connecting with specific social factors. These include an uncertain economic situation, unemployment, small salaries, poor housing, and migration. In the long run, these factors can only exacerbate the demographic decline in Belarus. Much like the Ravenka family from Slonim, which struggled to find money to make their initial mortgage payment, families with kids often face financial difficulties. On 16 November 2016, one of the leading official newspapers, Belarus Segodnia, told the story of Aliaksandr Pastolau, a father of four. After losing his job in Minsk, he decided to downshift and moved to a village in the Dokšycy district (Viciebsk province). In August 2016, Pastolau found a house to rent and started planning to launch a small family-run farm. However, not more than a month later, social services and the local school authorities started to frequent the house. They claimed that Pastolau's children were not receiving adequate care and attention. 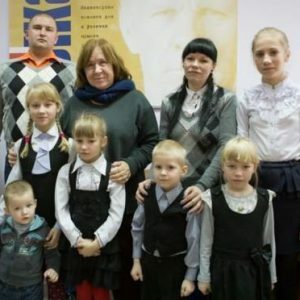 Threats of termination of parental rights forced the family to return to Minsk. In the Pastolau's case, safety concerns regarding heating in the house prompted local authorities to choose an overbearing manner of communication with the newcomers. Eventually, this provoked a conflict. This incident illustrates how state institutions treat large families with a heavy dose of legalism and scrutiny. Often, they use the well-being of the children as a justification to interfere in family matters. Moreover, ordinary Belarusians can be suspicious of large families. Having more than two children may lead to questions about whether the family is deliberately seeking social benefits from the state or is overly religious. Even the ideal large family of famous Belarusian actor Pavel Harlančuk, who raised five children, gave rise to such commentary from the public. Having a large family needs to become a more attractive option for wider sections of the population. Ideally, Belarus needs to develop more affordable housing programmes, expand the childcare system, and ensure that families do not feel economically insecure. Last but not least, the state should also pay attention to the change of attitudes to large families in society. Sweden, for instance, is a good model. It has promoted baby-friendly public spaces and improved the reintegration of new mothers into social life. On 15 November, at the 71st session of the UN General Assembly, the Belarusian delegation voted against a draft resolution tabled by Ukraine on the human rights situation in Crimea. This vote, along with Belarus’s failed attempt to adjourn debate on all country-specific texts, was perceived as a trick to torpedo Ukraine’s initiative and has angered many in Belarus and Ukraine. The move has lead to the Belarusian government being labelled a traitor and Russian vassal. So what is the rationale behind Belarus’s vote at the United Nations? Do Belarusian diplomats indeed take orders from Moscow? On 15 November, the Third Committee of the UN General Assembly considered four draft resolutions on human rights situations in specific countries, namely North Korea, Syria, Iran, and Russia-occupied Crimea. The last document was tabled by Ukraine along with twenty-nine other countries, including the United States, Georgia, and most EU members. The text called Russia 'an occupying power', condemned the human rights violations in Crimea by 'the Russian occupation authorities' and urged Moscow to take specific measures to remedy the situation. Five days earlier, Ukrainian President Petro Poroshenko tried to talk his Belarusian counterpart Alexander Lukashenka into supporting the Ukrainian initiative at the UN. Lukashenka offered him only a vague diplomatic reply. 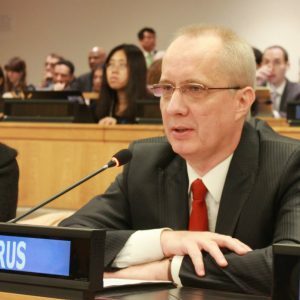 The Belarusian delegation in New York took many aback when Andrei Dapkiunas, the country’s ambassador to the UN, proposed to adjourn the debate on all country-specific resolutions. He called them a 'depressively divisive exercise with a known outcome'. This unprecedented motion was defeated with 32 votes in favour, 101 against, and 37 abstentions. The draft resolution on the human rights situation in Crimea was later approved by a vote of 73 in favour, to 23 against and 76 abstentions. Belarus was among those nations voting against, alongside Russia, Armenia, Kazakhstan, Uzbekistan and several human rights pariahs. Belarus’s vote and its no-action motion sparked a strong negative reaction among the Ukrainian elite and democratically-minded people in Belarus and Ukraine. Iryna Herashchenko, deputy chair of Ukraine’s Verkhovna Rada, called Belarus’s vote 'a stab in the back'. Volodymyr Yelchenko, the Ukrainian ambassador to the UN, labelled Belarus’s position anti-Ukrainian, adding: 'We cannot accept the fact that our closest neighbour stands openly against us in the UN'. Social networks and online forums were swarmed with Belarusians and Ukrainians who characterised the Belarusian government’s actions as pro-Russian, disgraceful, and treacherous. At the end of the day of voting, Dmitry Mironchik, the Belarusian foreign ministry’s spokesman, reacted to this outpouring of criticism by saying that 'it does not reflect reality'. Mironchik stressed that 'Belarus’s position on Ukraine [has] not change[d] a jot', without elaborating on the exact nature of this often ambiguous position. The foreign ministry explained Belarus’s actions at the UN by underlining Belarus's aversion towards country-specific resolutions on human rights and its 'consistent rejection of the hypocritical treatment of human rights issues'. Indeed, over the last few years, the Belarusian delegation at UN meetings in New York and Geneva has staunchly opposed all resolutions directed against specific countries even if it meant protecting notorious human rights pariahs. This is not particularly surprising as Belarus itself remains a target of such a resolution in Geneva. Belarus’s decision to submit a no-action motion on the entire agenda sub-item was meant to strengthen its alibi on the Crimea issue. On the same day, Belarus also voted against all other resolutions, citing a principled rejection of this politicised tool. In fact, this is not the first time that Belarus has explained away the fact that it's vote on a Ukraine-related issue concurred with Russia. It has used certain extraneous considerations as an excuse before. Interestingly, if Belarus had submitted the no-action motion on the Crimean draft alone, it would have had a much higher chance of success. However, the move against all texts 'in the package' was doomed to fail. Too many countries sought to condemn human rights violations in at least one of the countries singled out. Tellingly, Saudi Arabia – by no means a human-rights champion – vehemently opposed the Belarusian idea as it had issues with Syria and Iran. Mironchik’s arguments failed to convince most critics, who persist in labelling the Belarusian foreign ministry a Russian vassal or, at least, a loyal foreign policy ally. Belarus’s foreign minister Vladimir Makei apparently confirmed the latter assertion on 22 November in Moscow when he reaffirmed that 'the positions of Moscow and Minsk coincide in virtually all issues on the foreign policy agenda'. Meanwhile, the real picture remains more ambiguous. Belarus refused to follow Russia in recognising the independence of its satellites, Abkhazia and South Ossetia. It insisted on maintaining diplomatic relations and a visa-free regime with Georgia, Russia’s enemy. Minsk continued to strengthen its ties with Istanbul in the context of anti-Turkish hysteria in Moscow. It never sided with Russia in its rhetorical war against the West over Syria. Belarus’s refusal to recognise the annexation of Crimea de jure and its uninterrupted political, economic, and military cooperation with Ukraine at the height of the crisis in Donbass enraged many in Moscow. Belarus’s voting record at the UN is empirical evidence of Minsk’s independent foreign policy. Out of the 75 resolutions put to a vote at the 70th session of the General Assembly, Belarus and Russia adopted different positions on 28 texts. On nine occasions, their votes were diametrically opposite. The voting record at the UN is telling of the wide variety of issues under discussion there. At the last session, Belarus and Russia voted out of sync mostly on nuclear disarmament issues, but also on other disarmament-related matters, Palestine-related issues, and even on human rights. By voting differently from Russia on the IAEA annual report, Belarus in fact failed to support Russia in its demarche related to the status of Crimea. Some of Minsk’s initiatives at the UN have not pleased Moscow. This was the case when Belarus proposed reforming the process of appointing new UN Secretary Generals. Belarusian diplomats tried hard to find an alibi for their Crimea vote. However, the true reason for their position remains Lukashenka’s unwillingness to enrage Russia, especially on the eve of his important meeting with Vladimir Putin. Far from being Russia’s obedient servant in the international arena, Belarus remains conscious of the lines it cannot afford to cross with regards to its foreign policy. This clearly includes supporting a direct international condemnation of Russia or even abstaining on the issue.